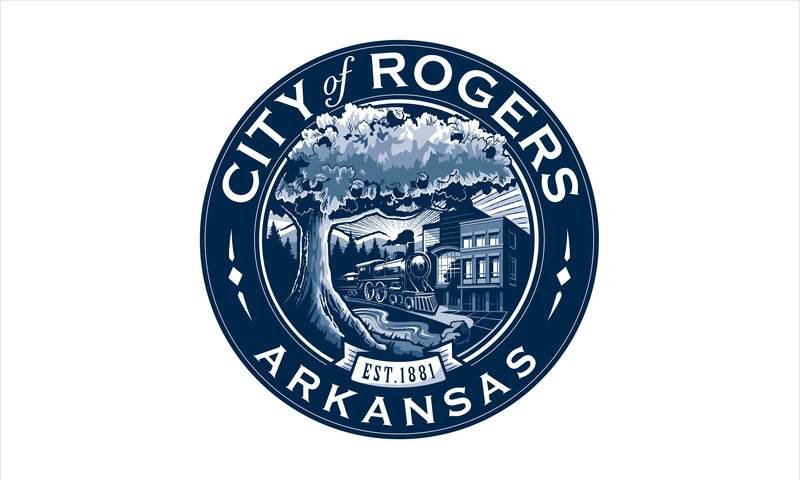 The flag of the City of Rogers, Arkansas, is a white with city seal on it. Photo of the flag on Waymarking website: www.waymarking.com/waymarks/WM6FND. "Rogers is a suburban city in Benton County, Arkansas, United States. As of the 2000 census, the city is the ninth most populous in the state, with a total population of 38,829, however, in 2006 a special census determined that Rogers had a population of 48,666. According to the 2007 Census Rogers has a population of 54,959." The flag for Rogers, Arkansas, is a white flag with a blue seal in different shades. It uses the image at http://www.rogersar.gov/calendar/Rogers_Seal%20Blue.jpg as seen at the Aquatic Center and baseball fields (a shopping center near Cross Church uses it as well).